THIS SITE IS UPDATED OFTEN TO HELP YOU FIND YOUR WAY AROUND THE COSMOS. 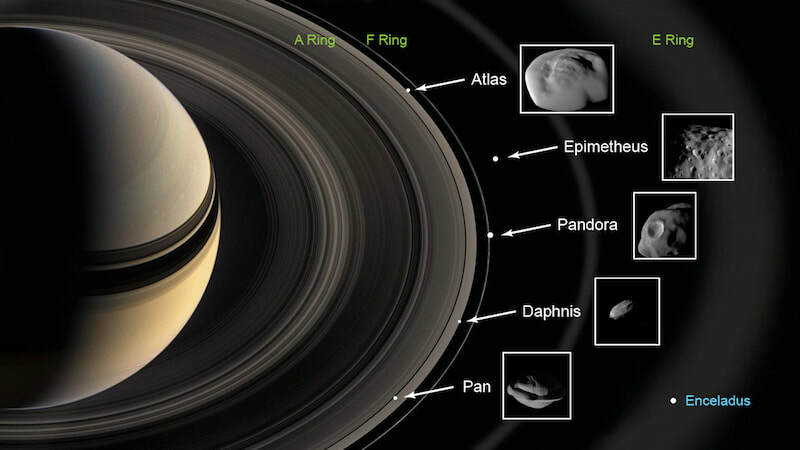 New findings have emerged about five tiny moons nestled in and near Saturn’s rings. Super-close flybys by NASA’s Cassini spacecraft – which orbited Saturn from 2004 to 2017 – reveal that the surfaces of these unusual moons are covered with material from the planet’s rings – and from icy particles blasting out of Saturn’s larger moon Enceladus. Planet Saturn has 62 moons, ranging in size from tiny moonlets less than .6 miles (1 kilometer) across to the enormous Titan, which is larger than the planet Mercury. The five moons inspected by Cassini were Atlas, Epimetheus, Pandora, Daphnis and Pan. 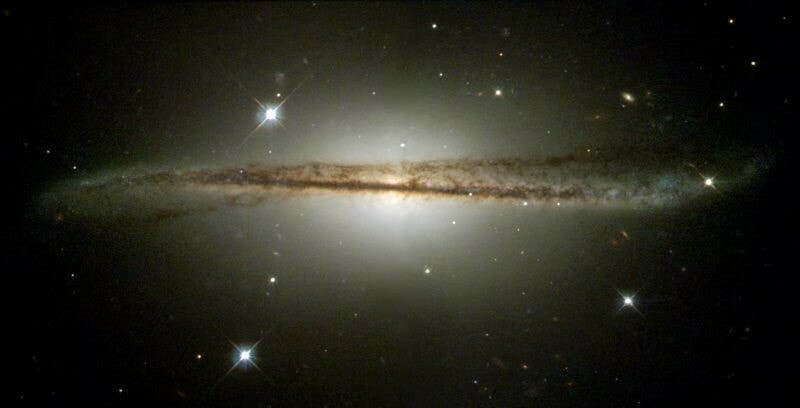 We think of spiral galaxies as being flat. 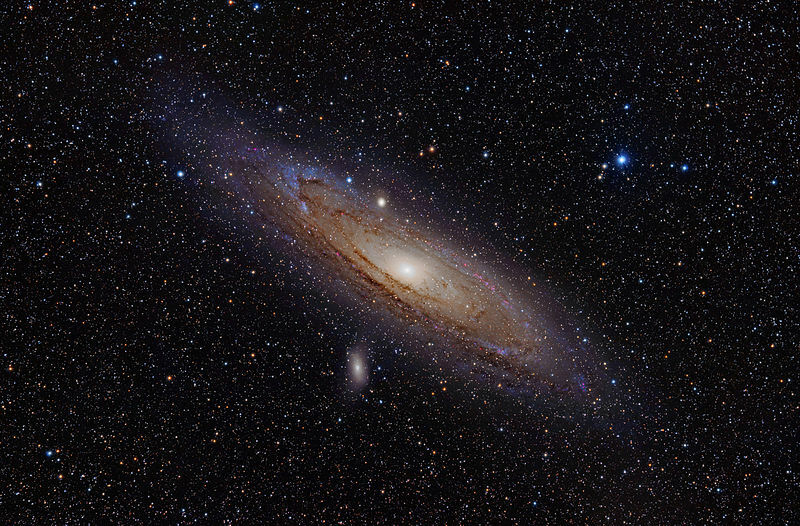 You often hear the disk of our galaxy described as “flat as a pancake.” The large spiral galaxy next door – the Andromeda galaxy – looks flat through a telescope. 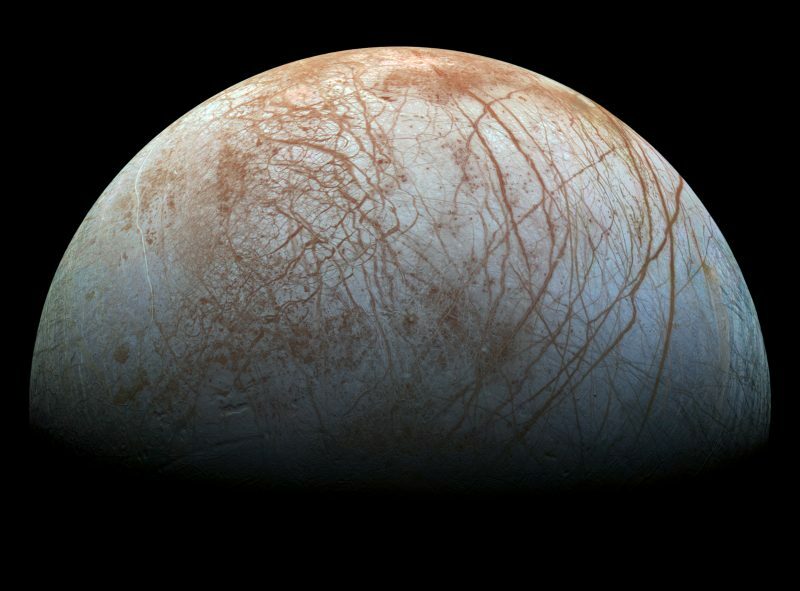 But nature can be intricate, and, this week (February 4, 2019), astronomers made a surprising announcement. They said our home galaxy, the Milky Way, isn’t flat. Instead it’s warped and twisted. Astronomers from Macquarie University and the Chinese Academy of Sciences used 1,339 classical Cepheid variable stars for this study. They are stars that brighten and dim in a way that changes according to the stars’ true luminosities. Thus these stars have been used as classic distance indicators. The astronomers used data on these stars from the Wide-field Infrared Survey Explorer (WISE). The work led them to create a 3D map of what they said is the “real” shape of our Milky Way. A paper describing this study was published February 4 in the peer-reviewed journal Nature Astronomy. The astronomers’ statement said: They found the Milky Way’s disk of stars becomes increasingly ‘warped’ and twisted the further away the stars are from the galaxy’s center. Astronomers don’t like to think of our Milky Way as being in any way “special.” But – from what’s known today – its twisted shape does give it a specialness, although not a uniqueness. Astronomers have observed a dozen other galaxies that showed similarly twisted spiral patterns in their outer regions. So our Milky Way’s twists are rare, but not unobserved elsewhere in the universe. A new celestial visitor has been discovered by Japanese astronomer Masayuki Iwamoto. As of December 26, 2018, reports of observations of the comet were coming in from observatories around the world. It’s a fast-moving comet that will be closest to Earth by February 2019. The celestial visitor will safely pass by Earth at some 28 million miles (45 million km). The comet has been designated C/2018 Y1 (Iwamoto). Closest approach to Earth should occur around February 11-12, 2019. Preliminary estimates suggest the newly found comet might reach a brightness or magnitude between 7.5 and 8.9 , which means it should be easily seen with small telescopes and perhaps even in binoculars in a few weeks. The Pleiades star cluster – also known as the Seven Sisters or M45 – is visible from virtually every part of the globe. It can be seen from as far north as the North Pole, and farther south than the southernmost tip of South America. It looks like a tiny misty dipper of stars. If you’re familiar with the famous constellation Orion, it can help you be sure you’ve found the Pleiades. See the three stars in a row in Orion? That’s Orion’s Belt. Draw a line through these stars to the V-shaped pattern of stars with a bright star in its midst. The V-shaped pattern is the Face of Taurus the Bull. The bright star in the V – called Aldebaran – depicts the Bull’s Eye. A bit past Aldebaran, you’ll see the Pleiades cluster, which marks the Bull’s Shoulder. Although several dozen minor galaxies lie closer to our Milky Way, the Andromeda galaxy is the closest large spiral galaxy to ours. Excluding the Large and Small Magellanic Clouds, which can’t be seen from northerly latitudes, the Andromeda galaxy – also known as M31 – is the brightest galaxy you can see. At 2.5 million light-years, it’s also the most distant thing visible to your unaided eye. To the eye, this galaxy appears as a smudge of light larger than a full moon. Space Weather News for May 25, 2018 http://spaceweather.com https://www.facebook.com/spaceweatherdotcom JELLYFISH SPRITES OVER OKLAHOMA: Last night in Oklahoma, a swarm of jellyfish sprites flashed above an intense thunderstorm approaching Oklahoma City. A photographer caught the display at nearly point-blank range, only ~80 miles away, which is unusually close for these forms of upward-directed lightning. Visit today's edition of Spaceweather.com to learn more about jellyfish sprites and why more of them may be in the offing. Remember, SpaceWeather.com is on Facebook! 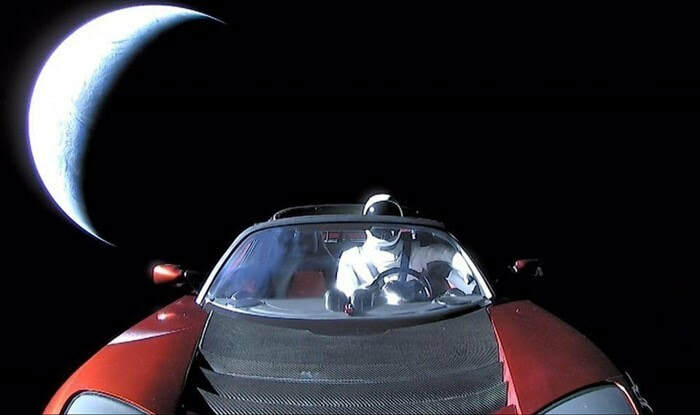 A camera mounted ahead caught this image of Starman, in Elon Musk’s red Tesla Roadster, as car and mannequin left Earth behind. Calculations by astronomers in the days after the launch suggest the payload reached a speed of 20.8 miles per second (33.5 km/sec) after the last burn, a faster speed than expected. Image via SpaceX. Last Tuesday (February 6, 2018), SpaceX’s Falcon Heavy successfully lifted off from Launch Complex 39A at Kennedy Space Center in Florida. Falcon Heavy is now the world’s most powerful operational rocket by a factor of two, providing a heavy-lift capability not seen since the Apollo era in the late 1960s and early ’70s, when mighty Saturn V rockets lifted astronauts to the moon. Falcon Heavy’s launch last Tuesday was a test flight, its maiden voyage, meant to prove the concept of the rocket itself (which is in essence three of SpaceX’s Falcon 9 rockets joined together). It definitely did! But SpaceX founder and CEO Elon Musk, as always, went further. He and his team placed Musk’s 2008 Tesla Roadster at the top of the rocket, with the goal of blasting it into an elliptical orbit between Earth and Mars. The orbit would, at times, bring the car – with its passenger, a mannequin nicknamed Starman, dressed for space – near Mars. The Falcon Heavy rocket test was a major success and a thrill for space fans. After livestreaming views from StarMan’s vantage point in Earth orbit SpaceX reignited the upper stage’s engine one last time, giving the Tesla a push beyond Earth’s orbit. 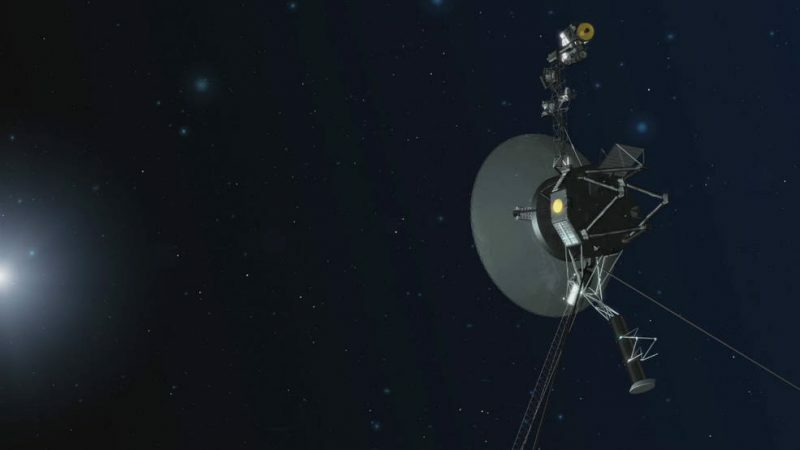 Humanity’s farthest and longest-lived spacecraft, Voyager 1 and 2, achieve 40 years of operation and exploration this August and September. Despite their vast distance, they continue to communicate with NASA daily, still probing the final frontier. Their story has not only impacted generations of current and future scientists and engineers, but also Earth’s culture, including film, art and music. Each spacecraft carries a Golden Record of Earth sounds, pictures and messages. Since the spacecraft could last billions of years, these circular time capsules could one day be the only traces of human civilization. Our sun is located about two-thirds of the way out from the center of the Milky Way. Illustration via Caltech. The planets in our solar system orbit around the sun. One orbit of the Earth takes one year. Meanwhile, our entire solar system – our sun with its family of planets, moon, asteroid and comets – orbits the center of the Milky Way galaxy. Our sun and solar system move at about about 500,000 miles an hour (800,000 km/hr) in this huge orbit. 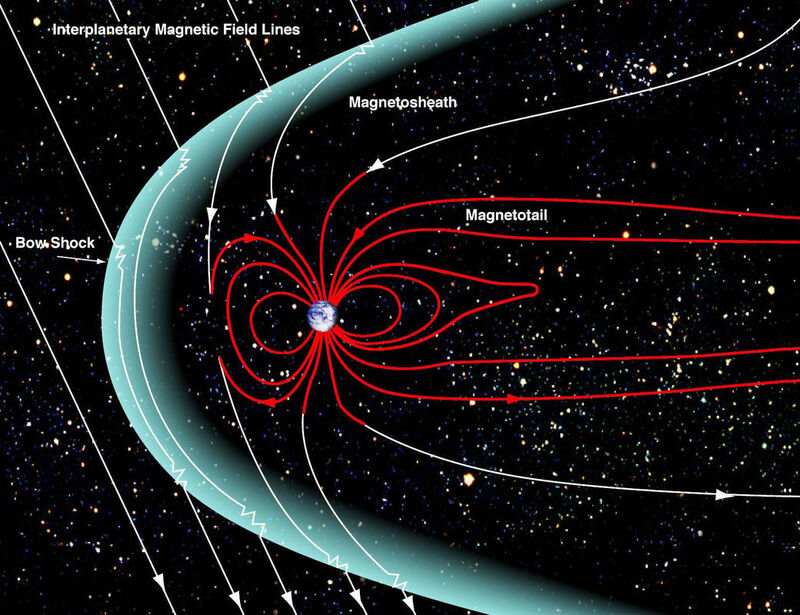 So in 90 seconds, for example, we all move some 12,500 miles (20,000 km) in orbit around the galaxy’s center. Our Milky Way galaxy is a big place. Even at this blazing speed, it takes the sun approximately 225-250 million years to complete one journey around the galaxy’s center. This amount of time – the time it takes us to orbit the center of the galaxy – is sometimes called a cosmic year. This artist’s concept puts solar system distances in perspective, but you have to think about it a bit to understand it. The scale bar is in astronomical units (AU), with each set distance beyond 1 AU representing 10 times the previous distance. One AU is the distance from the sun to the Earth, by the way, which is about 93 million miles or 150 million kilometers. Neptune, the most distant planet from the sun, is about 30 AU. Informally, the term solar system is often used to mean the space surrounding our sun, out to the last planet. Astronomers, however, might speak of the solar system as the heliosphere, or sphere of the sun’s influence. Our dominates its own region of space and creates a sort of bubble of charged particles in the space surrounding it. These particles are “blown” out from the sun by the solar wind. It’s this heliosphere that Voyager 1 has now left. NASA says Voyager 1 actually crossed the heliopause, the boundary around the region of the sun’s influence, over a year ago, on August 25, 2012. It’s also possible, though, to picture the solar system as going out to the Oort Cloud, the source of the comets that swing by our sun on long time scales. Beyond the outer edge of the Oort Cloud, the sun’s gravitational influence begins to wane. 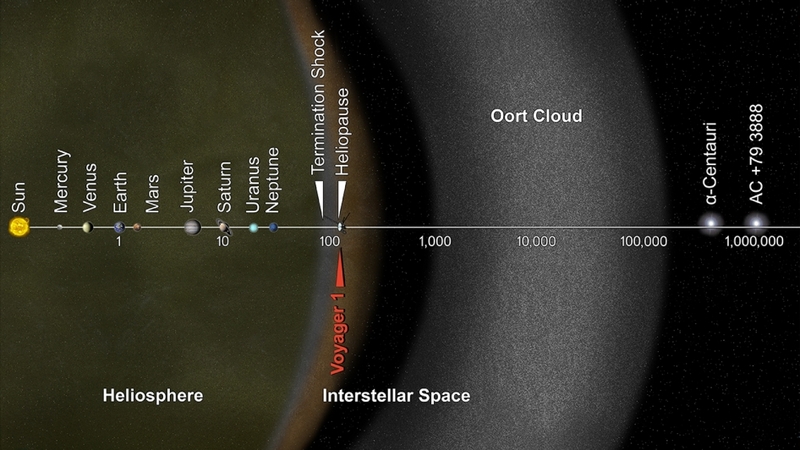 The inner edge of the main part of the Oort Cloud could be as close as 1,000 AU from our sun. 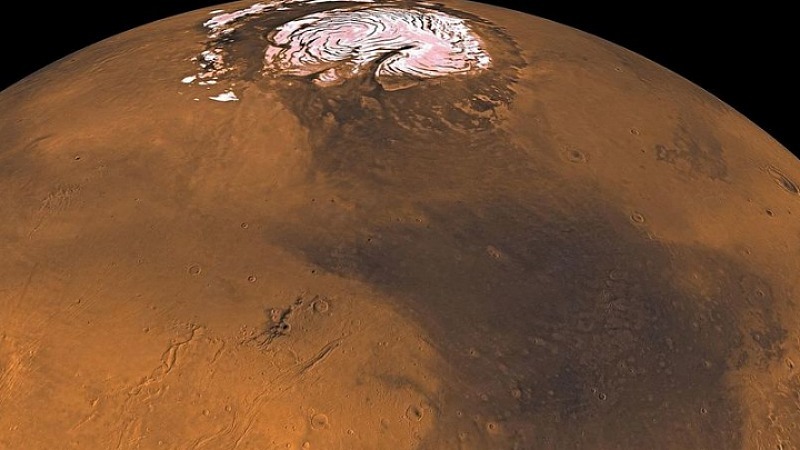 The outer edge is estimated to be around 100,000 AU. So that’s 100,000 times the Earth-sun distance.